The hot start-up is targeting as much as $600 million in revenue this year. Pinterest, one of Silicon Valley's hottest startups, just added more cash to its war chest, increasing speculation about its plans to go public. The company has raised $150 million from existing investors, valuing it at $12.3 billion, a Pinterest spokesperson said. That's up from the $11 billion valuation it had in 2015. Investors paid the same price per share as two years ago, but the valuation increased because additional shares have been issued, the spokesperson added. The identities of the latest round of investors were not revealed, but previous investors include Andreesen Horowitz, Bessemer Venture Partners and Fidelity. Pinterest said it will use the cash raised to fund its visual search technology and global expansion priorities, as it looks to attract more users outside the U.S. and delves further into the augmented reality space, primarily through its Lens product. Some believe Pinterest's latest funding round means the company is delaying its IPO plans, while others say it could be Pinterest's last capital raise before going public. Rohit Kulkarni, managing director at private securities investment firm SharesPost, thinks the modest $150 million investment signals that Pinterest could be getting closer to profitability -- a welcome detail when paired against other IPO hopefuls such as Blue Apron and Spotify that are still deep in the red. Snap (SNAP - Get Report) , which went public in March, also remains unprofitable. "Pinterest is still probably two years out from an IPO," Kulkarni said. "But if it is profitable and they're able to grow revenues at a premium rate of about 40%, my guess is that would imply a pretty big valuation for Pinterest." The company is reportedly targeting as much as $600 million in revenue this year, marking a major increase from when it brought in $100 million in 2015. Twitter (TWTR - Get Report) by comparison, had $317 million in revenue in 2012, one year before it went public. That said, Kulkarni reiterated that Pinterest is still in its "early days" with monetization, and has room for more upside there. Pinterest began offering its first advertisements in 2014 with the launch of promoted pins, which featured ads from retailers and other businesses. The ads only appeared in some search and category feeds. Since then, Pinterest has put more and more manpower behind the business of search and video ads -- areas that are traditionally dominated by digital search giant and Alphabet (GOOGL - Get Report) unit Google. Part of that push was motivated by ad buyers and marketers who complained that the company was taking too long to roll out ad products and other ad tech tools, according to the Wall Street Journal. Pinterest is clearly listening to those demands, having added more offerings for advertisers in recent months. In May, Pinterest brought advertisements to its Lens feature, which lets users snap photos of objects they see and, using machine learning technology, generate links to similar objects. At the same time, Pinterest is in the process of shedding its image as a social media network in favor of being known as a visual search engine. That could be an attempt to avoid comparisons to Facebook (FB - Get Report) and Twitter during the IPO process, but Pinterest said the image is more in line with how people use the scrapbook-like site. That's where Pinterest gets the unique value proposition that's attractive to investors, Kulkarni said. "Pinterest has been fairly careful in carving out a value proposition, but there are elements of search, shopping and social which are unlike any other companies we have seen," he explained. "So it's a very unique value proposition." In order for Pinterest to live up to its lofty valuation, the company will have to prove that it can continue to scale out its advertising business and user base. The company's first U.S. billboard campaign, which was launched this week, is one way it's trying to achieve the latter. 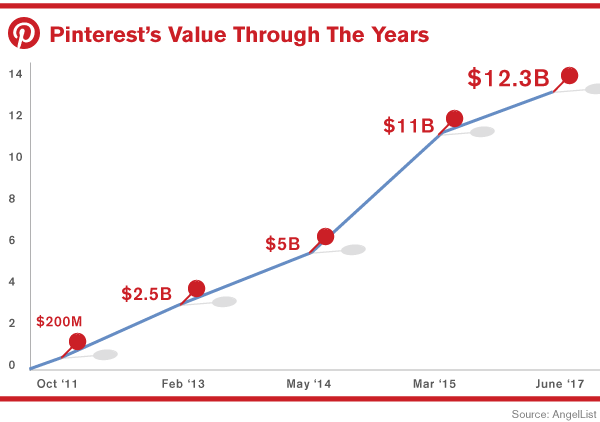 Investors will be paying close attention to Pinterest's average revenue per user (ARPU). "Facebook did show they could increase their revenue base while increasing ARPU and all followers, including Snap, hope to replicate that playbook," Kulkarni said. "But Pinterest probably has the highest potential to do that."